5 Best Bluetooth Shower Heads 2019: Play Music Wirelessly! The simple solution to that would be using your cell phone, however if it's NOT waterproof, you are SOL. Luckily, there's a unique solution! Pretty much, what this guide is intended to do is help you find the best bluetooth shower heads that you could buy today. These are shower heads that play music from a speaker that is carefully integrated with the whole shower head. Taking care of it is as simple as charging your cell phone, so its fairly straight to the point. As you proceed to read this entire page, you'll see the current most recommended shower head speakers that I think would suite you BEST. Below you'll find a quick overview of the most recommended ones, followed by reviews which will give you a quick enough understanding of what the specs are so you know whether to proceed ahead. What to Look for in Bluetooth Shower Heads? KOHLER is a company that's been with us for quite some time. Since they have a very respectable place in our community, we thought it would be interesting to include one of their products on our list. K-9245-CP Wireless Speaker Shower head is on the more expensive side of the spectrum, yet it justifies its price to an extent. For instance, it has a simple design, featuring a cone-shaped shower head, alongside a hinge that holds it to the wall. In the middle of the shower head, we have an amazing wireless speaker that produces lovely sound. Another important thing to mention is that KOHLER actually gave us a few choices! Oh, yeah, we can choose water jet strength in two variants; 2 GPM and 2.5 GPM. Of course, the latter is quite better. Aside from that, we have a Chrome finish, but if you aren't insane for Chrome, you can choose Bronze, Nickel or White finish. Next thing we have is a Bluetooth speaker that can connect to almost any device that supports Bluetooth technology. You can now play music from your MP3 player, laptop, or smartphone located up to 32 feet away. However, we have a small complaint about the Li-Ion battery in this shower head. Unlike many other shower heads that last around 12 hours, this one will last you no more than 7 hours of regular playtime. Think what you want, but having a long-lasting battery for a price of $96.04 is what I need and require. Other than that, the speaker is removable, so you can stream your music in any room. That's...well, nice to know, considering its higher price. KOHLER K-9245-CP produces a clear, quality, and strong water jet for an everyday shower. The Bluetooth speaker is great. It sounds clear and has enough sound clarity. On top of that, it's detachable from the shower head. You can easily connect any device that supports Bluetooth, including laptop and smartphone. It comes in a wide variety of colors and water jet strengths, which is always a plus. The design isn't especially beautiful. The rechargeable Li-Ion battery will last you about 7 hours of playtime, which is unacceptable at this price point. With its price of $94.06, it isn't the most affordable shower head out there. Next, on our list, we have a great fixed bluetooth shower head that comes from a less-known company YOO.MEE. This company might not be the greatest thing you've heard of, but YOO.MEE might be one of the best products we've seen so far! If we just get over the fact that it's fixed, we can pretty much call this shower head perfect. Design-wise, it looks a bit like the previous product on our list, with few differences here and there. The main difference is the build quality. When speaking about the build quality, I'm quite surprised it's made of ABS plastic, which is apparently heat-resistant. I don't know about you, but I'm not a huge fan of plastic. Next thing we see is that the Bluetooth speaker is removable, so you can use it outside of your shower area; that's nice! The other thing that's nice is a relatively-new Bluetooth 4.0 technology, which grants speed and the quality of sound you've never heard of. Unlike Morpilot's dhower head, this one had zero issues with the device syncing. We could easily sync a few devices, and when we tried to connect to the speaker, it worked with every device. Finally, it's important to mention its battery that can last you about 12 hours of continuous playing, which is great if you like to listen to Pink Floyd and their "short" songs. All, in all, this is one of the best bluetooth shower heads under thirty bucks. The Bluetooth speaker is removable, making it great for use outside of your shower space. Installation is easier than ever. You'll need no more than 20 minutes to do so. It comes in both Chrome and White finish, and the price for both is similar. The speaker playtime is around 12 hours, which is more than enough for every user. A rechargeable Li-Ion 1100 mAh battery takes around 3 to 4 hours to charge. One of the best for under $30. The build quality isn't impressive. No advanced speaker function like rewind, forward or pause. The water stream isn't the strongest we've seen. 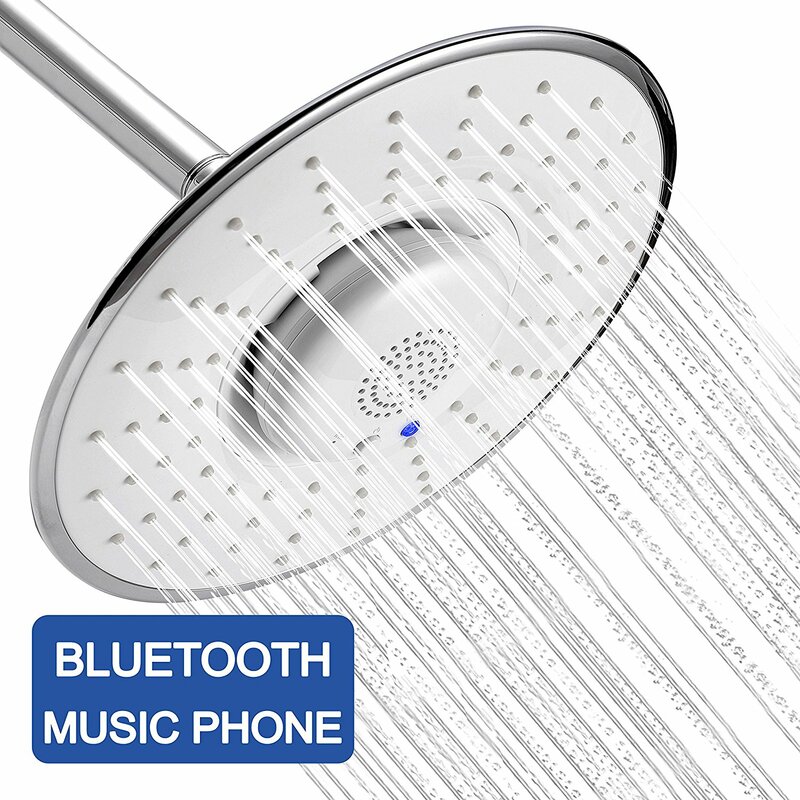 Are you ready to take the shower of your life with Bidget4Me MSH-10 Bluetooth Music Shower head? Since this is the first product on our list, we had a special honor in testing it and seeing how well it performs. 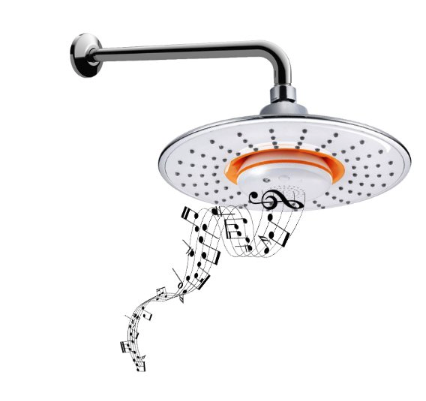 From our experience, this shower head is for the true music lovers. You can pretty much forget about your solo concerts under the shower and by doing this, you'll also save your vocal cords a little bit, too! Jokes aside, this is a fixed bluetooth shower head with lots of stuff to offer. Let's begin by mentioning its high-quality chrome-finished design. Oh, I absolutely love it! Aside from that, we have an ultra-wide drenching rain shower that will obliterate you with a pleasant water flow. For those worried about the water bill, well... with its flow rate of 2.5GPM, this one is a great money-saving option. When it comes to advanced capabilities, this one will not disappoint you. We have a wireless speaker that will let you enjoy your favorite music, as well as a dual microphone for answering the calls. You can now talk to your girlfriend while you take a shower, isn't that super duper cool? With its awesome noise-reduction capabilities and push-to-speak button, you'll never feel let-down. All of these features are accompanied by a silly effort needed to mount this shower head. Really - you'll need no more than 10 minutes! A nice-looking design that's almost premium for this price. The chrome finish feels nice to the touch. Due to its huge size, it has a powerful water jet that's going to make you satisfied. Has a wireless speaker that's independent of the shower head itself. The connection can be realized from 33 feet distance, which is impressive. Bidget4Me has an amazing sound quality and clarity. A push-to-speak function is always a great addition. The price of $24.99 is more than affordable. It's fixed, so you can't move it. Some syncing problems for more than 2 devices. The instructions sheet isn't very helpful. Let's say you have around twenty bucks to spend and you desperately want a high-quality shower head for your bathroom. Chances are that you aren't going to find what you need easily. 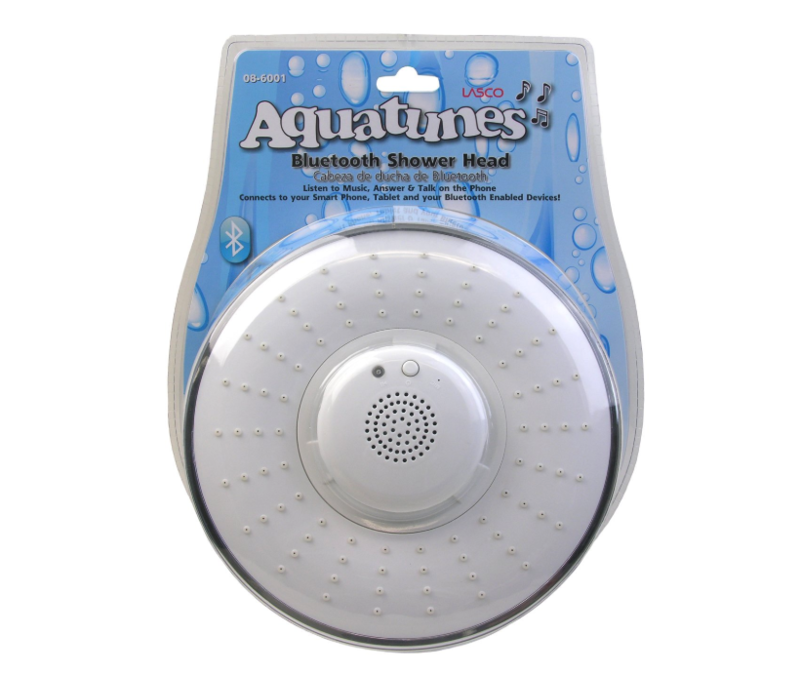 That's why we included Lasco Aquatunes Shower head that you can buy for exactly twenty bucks! Isn't that great? On top of that, this is a shower head that will breathe some new life into your boring bathroom - just what we needed. Many say that this bluetooth shower head is unique and I think they're right. For this silly price, you get a shower head where you can change songs, increase/decrease volume, and answer the calls. This is the only shower head that plays music which can change songs, which is awesome and cool! The buttons are located just below the Bluetooth speaker, so you won't have a problem covering the water jet while you tweak your sound and playlist. Another great thing about this jaw-dropping speaker is that you get a silicone carrying case for it. I mean, it's quite obvious that it's portable, so you can harass your family with your music everywhere in your house. While 8 hours of total playtime might seem a little out of hand, you can't tell it's a small number. After all, do you have a shower head that can change songs and volume? Me neither! This one is simply an epitome of bang that you get for your buck. Lasco Aquatunes bluetooth shower head offers an amazing value for the money. The design and build quality are respectable for the given price. You can change songs and manipulate volume, which is awesome and unique. It comes with a strong battery that allows up to 8 hours of playtime. Very easy and straightforward installation. A silicone carrying case is great for protecting your Wireless speaker. For a price of $19.99, you can't find a better product. The speaker can be a little wobbly when mounted inside the shower head. For the end of our list, we decided to mention a special product that's no other than a great Bluetooth speaker. That's right - this is a Bluetooth shower SPEAKER and not a shower head. As a matter of fact, it's waterproof, so you can still sing karaoke while you listen to your favorite music, and have no worries about water spraying all over the place. The great thing about the design here is that it doesn't even look like a proper speaker! You can assemble it in under 3 seconds and use a suction cup to stick it on the wall. Aside from that, we have tons of buttons that you can use to play/pause your song, answer the phone or pair with the new device. Furthermore, you can change songs and use the microphone during your phone call, while you rub your armpits and belly like a baby. If you like to dive in your jacuzzi, you'll be happy to know that you can submerge your speaker and carry it with you. Of course, you'll have to have a king-size jacuzzi to do so. We think you'll enjoy its 10-hour battery life, as well as its jaw-dropping sound quality. It's probably the best Bluetooth speaker for this price. 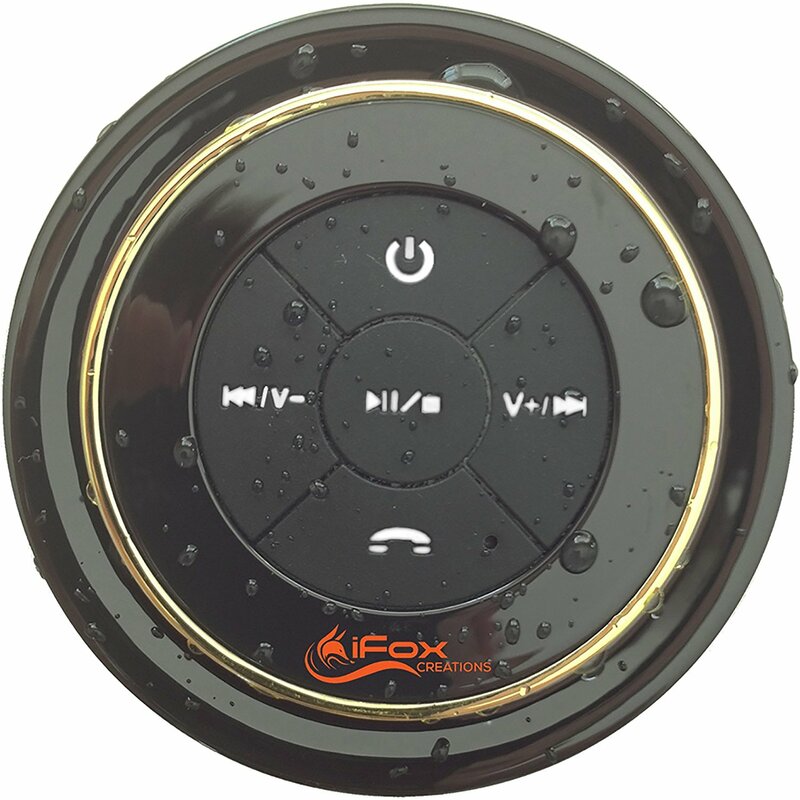 iFox iF012 is completely waterproof and submersible. The sound quality is second to none. It gives you an absolute control over your songs, volume, and phone calls. Relatively long battery life of 10 hours will give you some reasons to be happy. The speaker supports Bluetooth 5.0 technology, which is a new and unique feature. With its price of $29.99, it's all but expensive. The suction cup isn't the safest method for mounting. Some users reported significantly shorter battery life than mentioned in the product description. The Build Quality: Of course, you want a product that has an amazing build quality. Sure, you sometimes want to listen to music in the shower, but you also want it to be sturdy and durable. That's why you should always look for a material that feels nice to the touch and has some kind of finish on it (chrome, nickel, etc). Water Pressure: No matter how strong or how weak you want your water pressure, you should always inform yourself of this feature, simply because it can alter your shower experience greatly. I suggest you get a shower head that gives a nice water jet and saves a bit of water at a price of slightly lower water pressure. 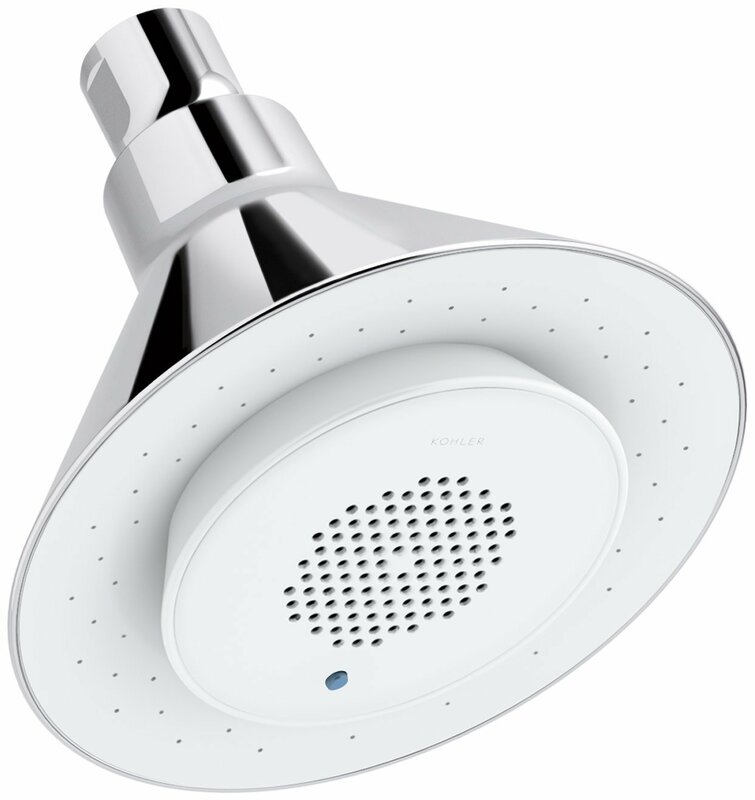 A High-Quality Speaker: Since Bluetooth makes a shower head music shower head, you want a speaker that can give you a nice blast of music in your face. Be sure to ask around and look for other people's experiences on the internet. Also be sure to find a bluetooth shower head with a good battery life. Connectivity: Some have issues when connecting to various devices. Be sure to check the specifications to find which devices are supported and how many of them. Ideally, it would be nice if you could hook up to three different devices to a single Bluetooth shower head. Design and Aesthetics: The last but not the least, it's important that you choose a beautiful shower head. Quite frankly, you won't find many differences when it comes to bluetooth shower heads, but hey... it's always nice when you can get a beautiful one. The great thing is that you can get a nice shower head for less than twenty bucks!